A splendid collective housing complex has arisen along a drab and dilapidated boulevard in Anderlecht. A former gold- and silversmiths’ building was for years a notorious squat and base for all sorts of shadowy organisations. Two of the partners in the BOB361 firm of architects, together with a third partner, took the initiative of clearing up this blot on the urban landscape. Now the historical complex houses offices for the architectural firm, homes for the three initiators, flats for sale and rent, and retail premises. After thorough demolition and renovation work, the building’s illustrious past was reshaped into an industrial setting suitable for a creative oasis for work and habitation. The meticulous reconstruction of the façade to its original, glorious state guarantees the unity of the street frontage. The core task was to create the space necessary to accommodate the overfull schedule of requirements. To achieve this, the first thing that had to be done was to thoroughly rid this historical complex of everything superfluous. Rear additions were replaced by green patios that reorganise the complex from the inside out. But in the remaining buildings too, the architects sought to reorganise with total freedom so that as many of the requirements as possible could be fitted in. The greenery (fruit trees, shrubs and herb beds), the outdoor kitchen, the visual connections and the multiple relationships between living and working animate the complex. The spontaneous liveliness and activity of the complex contrasts sharply with the anonymous individuality so characteristic of the collective housing built for property developers, which is based on the traditional division of labour between investor, architect and contractor. 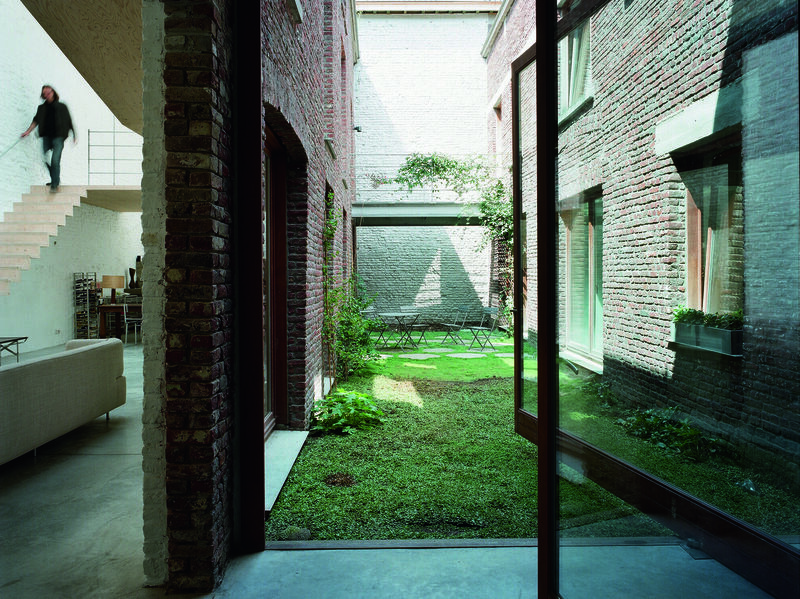 Even in the best quality property development (such as the delightful redevelopment of the Cotton Spinning Mill in Ghent to a design by Coussée & Goris Architects), the sterile, raked-over in-between spaces often leave no place for the activities you would expect from a collective housing project. The second starting point for this project is the finely-meshed transition between the public space and the private residential parts. In this way, the sociability of the collective work-home combination acts as an informal filter that insulates the individual residents from the hectic life of the metropolis. What is more, individuality is also protected by the eclectic design that gives each living and work unit its own specific features. Each partner was responsible for the design of their own share and was therefore answerable only to their own needs, desires and possibilities. For instance, there is the striking difference between the design of one living unit with X-shaped columns, round cut-outs in the concrete floor and shell roof and another, loft-like living unit with a gallery that floats free and a staircase in structural plywood. The living units meant for sale and rent are also all given a different character by means of differing architectural interventions. The personalization of the living units once again contrasts sharply with traditional property developments such as the Swimming Baths site in Leuven (also designed by BOB361), where individualisation remains limited to a checklist of choices, all at considerable extra cost. In the case of the abovementioned Cotton Spinning Mill, which was delivered in the shell condition, the housing units are considered a private matter. The internal organisation, fixtures and fittings, and design are entirely the responsibility of the future owner. An additional advantage to combining the roles of client and architect is that design and execution can be brought together. This leaves room for improvisation in the building process on the basis of chance discoveries, unexpected problems that arise, sudden design ideas, the skills of the contractor and the specific properties of the materials. For example, during construction they opted to cast extra concrete on the spot in traditional wooden plank formwork and to consider this finish as decoration. This is because the contractor turned out to be particularly well-versed in this construction method. Also, a patio which on the drawing board had been marked down as a parking space was at a later stage transformed into a green space. It turned out that, in the end, few prospective buyers considered the internal parking space to be worth more. In this way we see a shift in the role of the design in the framework of architectural production. Designing no longer means tying down the future on the basis of a building plan that arose arbitrarily and excludes a thousand and one other interesting possibilities. On the contrary, designing means constantly responding to the possibilities, capacities and skills that present themselves spontaneously in the course of the building process and which beg to be used. To summarise: for creative clients, design is tinkering with a running engine — and the importance of planning permission is futile in the face of the asbuilt certificate. The great independence of architect-clients is good not only for architectural quality, but is also an essential condition for a great many social improvements that architecture brings the surrounding neighbourhood. For example, this living-working oasis enables the local residents to enjoy the sight of the lively patios and green roofs. In addition, the specific location and choreography of the relationships between living and working make for a natural selection of residents. Most of them belong to the creative and entrepreneurial middle-class, who thus diversify (not to say ‘gentrify’) the population composition of Anderlecht in an unforced manner. Lastly, the creative vitality and activity on this drab boulevard offers a useful first step towards the long-awaited upgrading of this troubled deprived area. As architects, the initiators are well aware of the added architectural value their development brings to the neighbourhood and they made full use of this in their negotiations with the local authority. In this way, these entrepreneurial architects take responsibility, spontaneously and with abundant idealism, for a number of core tasks in contemporary urban development, which in the hands of administrative bodies often drags on far too long.